When we understand a bit about how the brain functions, it helps us to evaluate our own actions and motivations. Furthermore, if we can grasp the basics of what happens in the brain, it becomes easier to know how to guide our children: what to pay close attention to, what to take seriously, and most importantly, what exactly they need from us during their first years in order to develop awesome brains just primed for success in learning and life. In this drawing, we’ve highlighted the areas of the brain that are relevant to our discussions on BrainyTot. In the paragraphs below the drawing, we’ve included brief explanations of what each of these areas of the brain does. 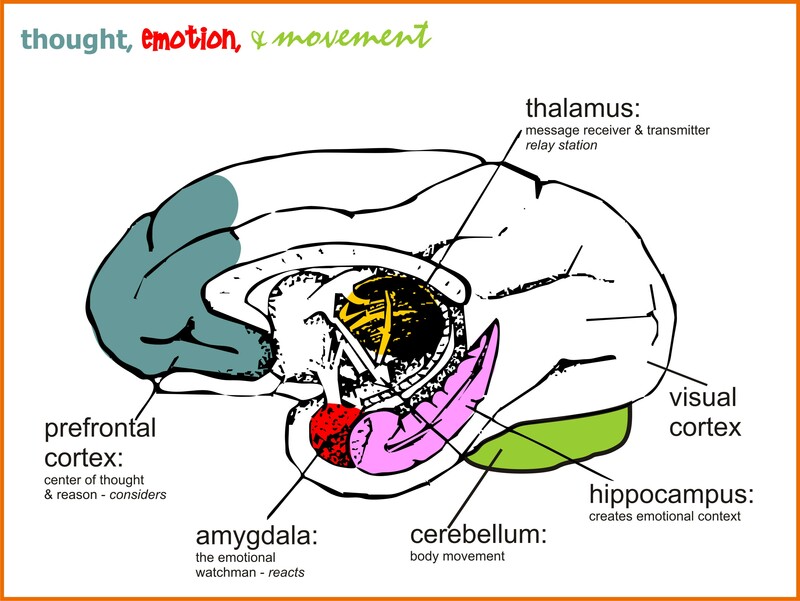 The amygdala is the brain’s emergency broadcasting system and repository of emotional memory. When signals arrive that the amygdala perceives as dangerous or exciting (“I see a gorilla!”), the amygdala fires up and messages brain and body to prepare for emergency (Run for your life!) or for imminent significant delight. Because the amygdala receives signals from the thalamus first, it is totally capable of hijacking the thinking part of the brain, meaning that the person will behave purely out of his messy emotions. Signals from the amygdala to other parts of the body produce sweaty palms, tremors, clenched teeth, dances of joy, boisterous laughter, sudden flight, and more. The amygdala is the first to fully develop in infants–even before the hippocampus–and the nature of interactions with parents during the earliest days and months create emotional lessons that are stored in the amygdala. These earliest lessons arise from the emotional attunement and responsiveness of the child’s parents to her needs, and from the emotional upsets that might occur. These emotional memories don’t come with any accompanying verbal narrative; they are instinctive emotional impressions the child might not be aware of but that will affect him throughout life. The prefrontal cortex is the very front of the brain, in the front region of the frontal lobes. Besides being the front of the brain geographically, it is responsible for the executive functions which include judging between conflicting thoughts, making choices between right and wrong or good and bad, predicting future events based on current evidence and past experience, and governing one’s impulses and emotions. This is the mind that is capable of evaluating our emotions and making a decision on whether or not to act on those emotions. The prefrontal cortex is the brain center most strongly implicated in qualities like thoughtful awareness, general intelligence, and personality traits. The prefrontal cortex can think abstractly, imagine, judge, distinguish, and evaluate. We all want our children to have a well-functioning, highly-developed prefrontal cortex! This interesting pepper-shaped area in the brain works closely with the signals that come to the amygdala, but rather than assigning emotions, the hippocampus creates contexts for those emotions. It is more concerned with perceptual patterns than emotional reactions. For example, the hippocampus will register the presence of a gorilla, but will distinguish between a gorilla found in the zoo behind several inches of safety glass, and a gorilla encountered lurking by your back door with one huge paw grasping the doorknob. One is super dangerous; the other is just interesting to observe. So when the eyes register the presence of the huge gorilla, the amygdala will react by shouting “DANGER! DANGER!” while the hippocampus will pick up environmental clues and say, “This gorilla is behind bars.” This is one region in the brain the prefrontal cortex taps as it gathers information upon which to base its decision of how to act. It is the hippocampus that allows us to remember many years after the fact exactly where we were and what we were wearing when we first heard a now-favorite song, or the exact spot where we first met someone very special. While a very general, and probably also very simplistic, overview of the most basic of brain functions that relate to emotion and thought, if you want to hear it directly from the expert, please get a copy of Emotional Intelligence by Daniel Goleman. It contains a lot of information about the neurology of feeling and thinking, and the information is so worthwhile.